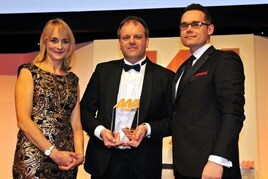 A highly commended entrant in this category last year, Pebley Beach was nominated for this year’s AM Awards by Hyundai, having taken the crown as its best dealer for aftersales in 2014. Pebley Beach is a dual-franchise business operating sites in Swindon and Cirencester. It strongly maintains a ‘no barriers’ approach within the sales and service team and consistently works to review and tweak its approach to customer service standards. New and innovative ideas are encouraged and welcomed from all staff and it is company policy to introduce at least one new process improvement each month. Success is not just measured against target figures or financial gains, but is also subjectively calculated against day-to-day levels of customer satisfaction through talking to customers and satisfaction surveys. It doesn’t extensively use CSI scores, preferring customer feedback via Motor Codes. In 2014, the business was voted the number one in the UK, with a score of 98% from 367 surveys. The business also has a policy of taking on young apprentices and moulding them to its preferred work ethic. Of people joining Pebley Beach, 43% are under 21 and begin at the company on a ‘young starter training scheme’ or under a structured apprentice scheme. The judges also noted its ‘train to leave’ scheme: if Pebley Beach can’t accommodate an employee’s ambitions, it commits to training them in an area of the business of their choosing at the company’s expense. In one example, a vehicle technician, Steve Strange, with ambitions to become a trainer, has become a part-time teaching assistant at the Hyundai Academy and runs Pebley Beach’s apprenticeship scheme. Pebley Beach also doesn’t focus on hours per job card, but more on hours per five-to-seven-year-old vehicle parc. It’s top in the UK for retail hours per seven-year parc for Hyundai.